Well, given that I've not yet reached nirvana (cough!) I don't know that I can pin point a moment when I felt like "a cohesive me, alive and present." Ignoring the poncey assumptions and language in this prompt ... which is hard ... the most integrated I've felt with my body this year was in Mexico. We spent six weeks there during the height of summer in a small, buggy, hot bungalow in San Blas. Bugs were feeding on us day and night, the heat was like being trapped under a wet blanket - with a hot steamer blowing underneath - and the rains were intense, flooding the little road we were located on so that for days we had to wade ankle deep through muddy water to get out of our little compound. I can remember washing out laundry by hand, dripping in sweat; I can remember being itchy; I can remember wanting to take the two hour bus journey to Tepic just because it was air conditioned and despite the motion sickness the bad roads would cause, at least I would feel cool for a few hours. I remember not being able to properly fall asleep until sunrise because I was so afraid of the giant spiders, millipedes and cockroaches crawling on me in the darkness. And I remember the few wonderful nights when the wind would pick up and cooler breeze would come in off the sea, and we would lay there on top of our sheets, feeling finally, mercilessly like we weren't crawling out of our skin. It sounds horrible but it was actually wonderful to be so present, to have my anxieties reduced to worrying about the heat, my bad stomach and the bugs. I could sense the slightest breeze picking up, the most subtle drop or rise in temperature ... I was grateful when an itchy mosquito bite would suddenly feel cool under the tea tree oil I'd applied. Although I would never want to experience it again, I recognize that the luxuries of my life are designed to keep me apart from physical experiences. I put up barriers between myself and discomfort and sickness so that I can ignore my physicality. I would be reluctant to trade away my physical comforts, but I learned a lot about myself during those long hot weeks in San Blas. 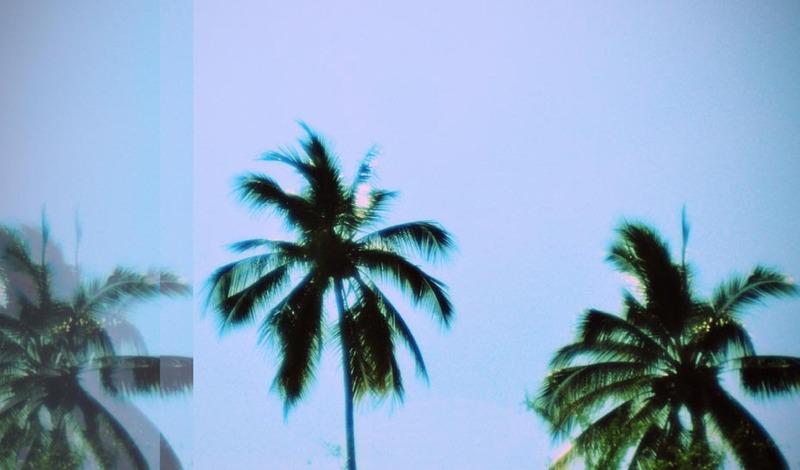 Image: San Blas Palm Trees by me.